Posted by Jason Keath in Life. This spot had been marked. Were ready to begin again. And I’ll wake to the break of the day. And wish tomorrow was farther away. A grapevine did fall with seedlings so small they shriveled to the size of a sip. Do you know which way the wind will blow when the world is so dry it will rip? And the dust settles sweetly with ships. Shadow settles sweetly and all listen neatly as night drips deeply from day. As the devil drinks scotch, sipping swiftly from rocks, hell will begin to decay. Will apathy at last fall from grace? Blood leaves the skin so pale. To live in the depth of detail. The little things will tell our tale. As the sun sips time through a straw. As the sunset suspends in soft awe. These damp days just won’t dry out. Deep beneath a rolling sea. there is a right to be heard. A big thanks to Nina over at www.NinaAlverez.net for posting my poem “Songbird Still” as the poem of the day over. Check out her website. There is loads of poetry appreciation to enjoy, along with some other insights. Also, she is offering a free poetry book to anyone who wants to submits their favorite poem and is selected as the “Poem of the Day”. On this pebble is an epic in hand. Here in these pages is the secret of man. Posted by Jason Keath in Life, Poem, Poetry, Writing. we dance by the light of the moon. and our eyes bend the stars into tune. Posted by Jason Keath in Creative Writing, health, Life, Poem, Poetry, Writing. 165 years ago two fateful literary giants casually explored literary theory in letters to one another. These two men were Edgar Allen Poe and Charles Dickens. 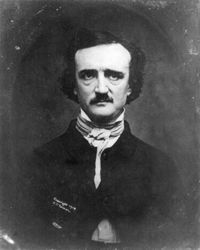 In one letter, dated March 6, 1842, Dickens influenced Poe by informing him of the interesting practice of writing a poem backwards, or writing the last stanza first. She empties seas and creates light. I know his will won’t let me rest. He steals my soul, I failed god’s test. She cools my brow and brings me peace.